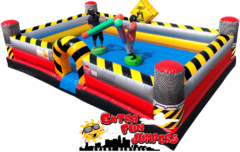 Compete in this inflatable arena on top of a pedestal, design to allow each player the opportunity to knock their opponent off. It comes with 2-helmets and 2-poles. Rent this unit for your next event and see who will be the next gladiator.